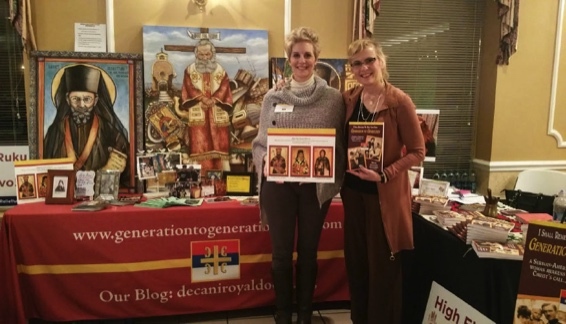 Francene Samaras Foster and Ariane at one of several exhibition opportunities for Ariane’s book, blog discussion and support of The Decani Monastery Relief Fund. 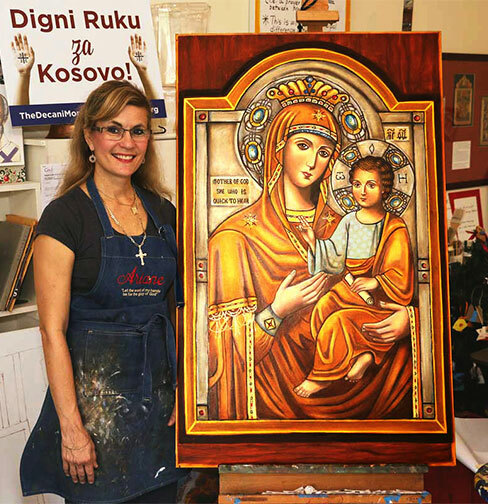 In July 2016, Ariane received the blessing of His Grace Bishop Longin to publish her book, “I Shall Remember Thy Holy Name from Generation to Generation,” which shares her personal journey and awakening to the beauty of the history of her Serbian parents and ancestors, and most of all her faith. Pictured left to right are: Father Serafim Baltic, Abbott of New Gracanica Monastery, His Grace Bishop Longin, New Gracanica and Midwestern American Diocese of the Serbian Orthodox Church, Ariane, and Father Marko Matic, parish priest at St. Sava Serbian Orthodox Church in Merrillville, Indiana. When I began my work a an artist, little did I realize how much more I would be doing beyond that. Since then, I have written a book to honor my ancestors, and I daily dedicate my life to cherishing my love and devotion toward God and expanding my Orthodox Christian Faith. I also work toward encouraging others to do the same, whether they are of Serbian lineage or not. I am most excited about the new series of podcasts I am taping along with my dear friend Francene Samaras Foster entitled “The Saints and Us, True Friends Sharing the True Faith.” Visit The Fellowship of Saint Matrona the Blind to hear our podcasts about Orthodox Christian Saints. We hope they might inspire you! As always, I continue to be passionate in supporting causes that support the Serbian Orthodox Faith my Serbian-born parents gave me. Because Kosovo/Metohija is Serbia’s Jerusalem. I value the ongoing humanitarian aid The Decani Monastery Relief Fund provides in this region. I am honored to be a board member of this non-profit. I treasure the Gramota (an official letter of recognition from the Orthodox Church) I received as a Decani board member in 2014 from the Diocesan Bishop Theodosije Sibalic of Raska-Prizren and Kosovo-Metohija. As a way to honor Serbia and the work of Decani, a portion of the sale of my book, “I Shall Remember Thy Holy Name from Generation to Generation,” goes toward Decani’s relief efforts. 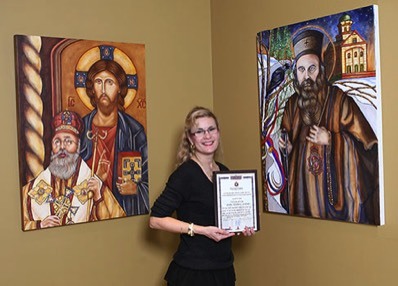 My colleague and old friend Francene Samaras Foster was so inspired by my story that she created a blog, Miracles of Our Orthodox Christian Wonderworking Saints. In this online acknowledgment and testimony, Orthodox faith-based contributors from across the globe have found a place to share their views on their faith, and recant their own personal miracle stories of the Saints of the Orthodox Christian faith and how they have affected their lives, along with Francene, the site’s director. People are encouraged to share their stories as a way of honoring Orthodox Saints for their inspiration. I pray and hope I can continue to strive each day to become a worthy descendent of my Serbian ancestors of God, such as my great grandfather, The Very Reverend Trandafil Kocić, who was canonized in 2017 as one of the Martyrs in the Serbian Orthodox Church and is honored on the Surdulica Martyrs Feast Day on May 26 on the Serbian Orthodox Church calendar. He was murdered at Surdulica in 1915 for simply being a Serbian Orthodox Christian priest. I honored him by dedicating my book to his memory and for his sacrifices. Both he and my grandparents, Lt. Colonel Velibor Dobrić and Darinka Kocić Dobrić, were instrumental in leaving a legacy of dedication to the principles of service to God and country which they held dear and serves as an inspiration to me every day. 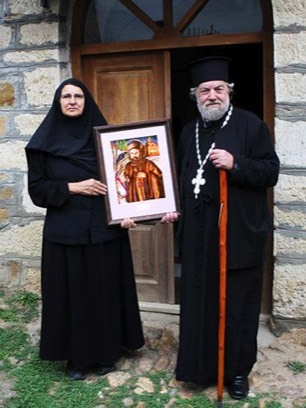 Abbess Anastasia (left) of Devich Monastery receives from The Very Rev. Archimandrite Nektarios Serfes the portrait of St. Nikolai (Nikolaj) Velimirović painted by Ariane Trifunovic Montemuro.